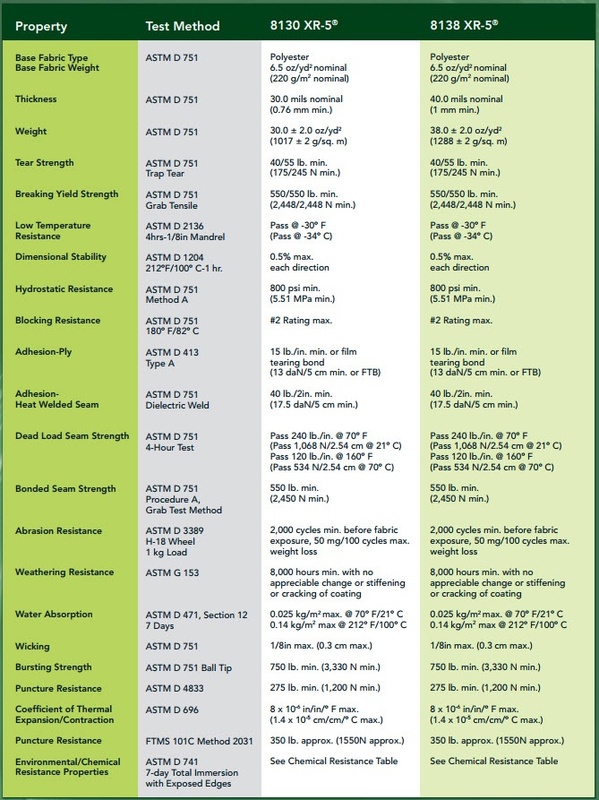 Strongest most durable geomembrane on the market, move over HDPE! Thicker Isn't Always Better! Problems associated with environmental stress cracking (ESC) plague HDPE. The EPA has identified this as a real concern and has issued communications concerning this material inherent problem. XR-5 is not subject to ESC and eliminates a potential problem for design engineers to consider. Several factors influence ESC including contact liquid, residual stress (seam welding), stress concentration (geometric irregularity / mechanical damage), fatigue (thermal cycling), localized stress (subsidence) and membrane surface imperfections (scratches / gouges / nicks). Don't let others try to minimize the problem of ESC. If this were not a problem then the research to develop resistant resins and improved test methods to measure ESC potential would stop. Reference (13) is an excellent example of test method development occurring at this time. The EPA recommends working stresses in HDPE be no higher than 10% of the minimum (not typical) specified yield stress for sheet material. That is a factor of safety equal to 10. This increased factor of safety relates to the inherent HDPE problems. With XR-5, using normal working stresses maintains a high factor of safety in adverse field conditions. Low working stresses requires using very thick HDPE membranes that makes installation difficult and probably adversely effects long term performance. Flexibility is an important factor for fabrication and ease of installation. The XR-5 reinforced membrane is flexible where HDPE is stiff. HDPE derives its strength from thickness versus the optimum use of reinforcement for a reinforced material like XR-5. XR-5 flexibility makes large prefabricated panels (15,000+ square feet) practical. Prefabrication in a controlled environment like a plant facility offers improved liner integrity and long term assurance of successful seam performance. Prefabrication significantly reduces the number of field seams. Reduced field seaming translates into shorter installation time, lower installation costs and most important improved membrane integrity. The literature supports the fact that factory seams out perform field seams. All seams in a HDPE installation are field seams since membrane stiffness will not allow prefabrication. Note: Pipe and support penetrations require additional filed seaming. Penetrations significantly complicate HDPE installation and require using fillet extrusion welding which is difficult and can affect future ESC occurrence. XR-5 flexibility makes handling easier and welding uses same seam configuration as prefabricated seams. The thermal expansion / contraction deficiency of HDPE can present problems even in those applications that will protect the liner with a cover material. Wrinkles that exist during the placement of the cover will not necessarily flatten but in many cases will either be left in a compressed vertical prayer position or a folded over prayer position. This can create two potential problems. In landfills this will create dams that will impede the drainage of leachate and if a hole exists in the liner (all liners will have holes) the head created by the wrinkle dam will accelerate the volume of leachate passing the liner. Two the local bending stress due to the folding will increases the likelihood of stress crack development. XR-5 will lay flat due to its thermal stability and if it happens to get creased it does not suffer from the stress cracking phenomenon. Seam type does not appear to improve resistance to stress cracking. EPA studies show this. Repairing seam defects can increase the potential for stress cracking. It is difficult to see the preliminary evidence of stress cracking that can lead to failure. Once failure occurs you can have the phenomenon of "Rapid Crack Propagation" (RCP). These cracks can propagate at speeds of 5000 ft./sec.. The importance of this is an HDPE repair is a major one with possible complete replacement required. If a tear or puncture in XR-5 occurs the heavy base fabric inhibits damage spread. This helps maintain the repair as a minor one when using XR-5. A maintenance group with a hot air repair kit and some practice can make repairs to XR-5. With polyethylene you need expensive specialized equipment and personnel to make repairs. A timely repair of HDPE is unlikely therefore impacts are expected on operations and the potential for increased environmental damage exists. HDPE is subject to brittle failure due to multi axial stress conditions encountered in the real world of field conditions. Manufacturer’s literature suggests elongation of hundreds of percent. Actual testing and analysis of field failures shows that in a three dimensional (real life environment) situation, failure occurs at elongation well within the range of yield conditions. There exists amongst the polyethylene manufacturers a variation in the use of HDPE for long term contact with hydrocarbons. In one manufacturer’s case, use in secondary containment is not recommended for some typical hydrocarbons (e.g. Jet Fuel). XR-5 has extensive experience in primary contact with hydrocarbons. We have immersed XR-5 in various hydrocarbons for several years of constant contact with no effect on the coating or physical properties of the geomembrane. HDPE may have excellent general chemical resistance but apparently there exists concern for long term hydrocarbon exposure. Seaman Corporation stands behind our assurance of chemical compatibility by issuing the industry's only limited warranty that includes both weathering and chemical resistance. A 1993 published API report discussing tank secondary containment lining materials found XR-5 ranked better than HDPE in chemical resistance to hydrocarbon liquids. The brittleness of field HDPE seams is not evaluated by current field construction quality control methods. Failures of HDPE seams are showing up and are linked to brittleness caused by installation conditions, sheet component dispersion, field welding procedure and climatic effects. HDPE is very sensitive to welding conditions. Less than optimum conditions causes crazing and micro-stress cracks which can accelerate seam failure in the near to long term depending on conditions and severity. A seam will test OK in peel and shear but in fact it has undergone significant changes that cause molecular rearrangement and brittleness at the seam. These findings should severely limit the installation of HDPE in low temperature conditions due to the severe thermal shock encountered and will cast serious doubt on the long term performance of the HDPE membrane in many applications. XR-5 is a cost effective liner system. This is supported by the following facts. The real cost of a liner system has several components other than material cost. These include costs related to installation, field CQA/CQC testing costs, maintenance, repair, longevity of product, terms of warranty and liability exposure. 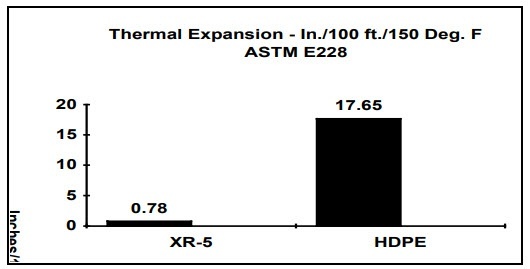 XR-5 will prove less costly in the long term through proven experience as a membrane. It is easier to install due to its prefabrication capability / flexibility and offers significant economy compared to HDPE for field CQA / CQC testing. The cost impact of field CQA for HDPE will continue to make XR-5 cost effective even with significant market variations in polyethylene material cost. For small to medium size projects and certain application conditions XR5 is less costly with out even considering the CQA effect. XR-5 is less likely to require repair/maintenance attention due to high strength compared to HDPE and because XR-5 does not have important inherent defects due to the chemical structure of the material. Repair of HDPE 4 typically requires the use of the fillet extrusion welding process which the process itself creates greater potential for ESC and failure. Finally since XR-5 is not subject to the technical deficiencies of HDPE (ESC, low strength etc.) the long term potential for failure and damage to the environment is less likely. Therefore the liability exposure is lower. A Value Engineering Study for the NSC Defense Fuel Support Point in Pearl Harbor, Hawaii that evaluated a variety of lining systems for areas around fuel storage facilities determined that a reinforced 30 mil (XR-5) liner system provides significant net life cycle savings compared to 80 mil HDPE. EPA or state agencies will only approve HDPE? This is not true. Government approval authorities cannot specify specific materials. Many outdated existing regulations do specify a minimum thickness of 40 mils. This does not exclude the use of XR-5. The current RCRA Subtitle D regulations differentiate between reinforced and unreinforced membrane materials. The new Subtitle D calls for 60 mil minimum unreinforced or 30 mil minimum reinforced. Regulators now recognize their standards apply to unreinforced materials and that reinforced XR-5 has performance properties that significantly exceed those of unsupported materials. A performance specification based on strength and chemical compatibility properties provides the optimum basis for material selection, not thickness. Seaman Corporation can help provide information to support the performance based specification. XR-5 has installed and proven field performance/experience since 1976, far exceeding HDPE experience in North America as a geomembrane. Many failures of HDPE have come to public attention far short of long term performance.